Abu Dhabi Fund for Development (ADFD) is an independent national entity affiliated with the Abu Dhabi Government - designated FOHMICS for delivering thier corporate Web Portal www.adfd.ae. 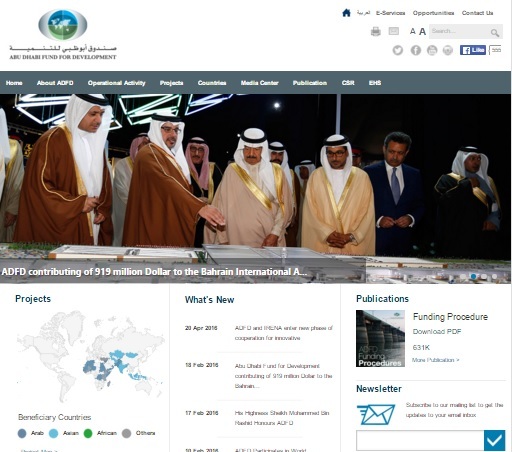 The bilingual Web Portal goes live towards end of year 2015, has been developed using SharePoint 2013. In order to update the contents, our team developed easy to use custom forms for major components instead of using tedious SharePoint list. Plus, an interactive project map has been the focus of this task. The project phase (2) was to migrate the existing intranet to SharePoint 2013. Our team has successfully completed both the tasks despite of practical challenges across the project.